Considering other statistics, CentOS does not seem to be the most popular Linux distribution. It ranks only #20 in the DistroWatch page hit statistics of the last month, and it is almost invisible in the Google trend chart compared to other popular distributions. 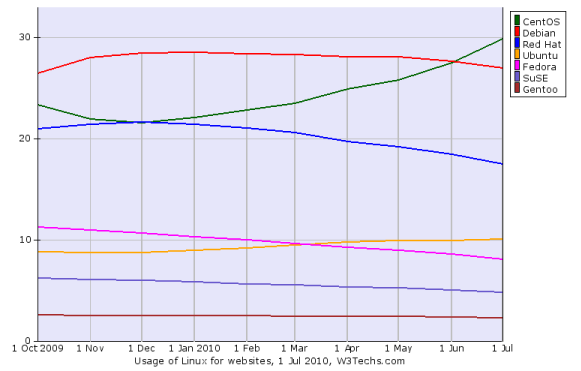 However, it has always been very popular in our survey of Linux distribution on web server where it is now a clear #1. Let's have a closer look at some of the detailed statistics. The technology change report shows, that CentOS is gaining primarily from Red Hat and Fedora, while it is loosing a bit to Ubuntu. Please note, that this report only contains changes between Linux distributions, and not, for instance, changes to and from Windows. Our ranking break down report shows, that CentOS is a bit less popular amongst large sites compared to average sites. The web server break down report shows that Sun servers technologies are particularly popular on CentOS machines whereas Nginx is rarely used. The top level domain break down report indicates that CentOS's market share is higher than average in Japan, Spain and Romania, and lower in Germany, China and Brazil. Whatever the reason for these subtle difference are, congratulations to the CentOS team for that achievement. Great news for the CentOS community! Too bad it is total shite. Expect to see ubuntu taking over that, as well. Slackware is popular with those who want to learn about the Systems Administration of Linux. There is a most-likely explanation why CentOS being popular webserver OS. It works really well for CPanel, a (probably the most) popular web hosting management and Zimbra Collaboration Suite (a groupware) which its open source edition is capable handling (also probably the most) popular mobile messaging device like Blackberry. Have been using Centos for a long time. It's really perfect! !